Cyanotic lesions on the tip of the ears of an animal affected by African swine fever. The animal had a high fever. Initially, there is a reddening due to the hyperhaemia that evolves towards cyanosis. The cyanotic areas can also appear on other parts of the body, such as the tail, the distal areas of the limbs, the chest or the abdomen. 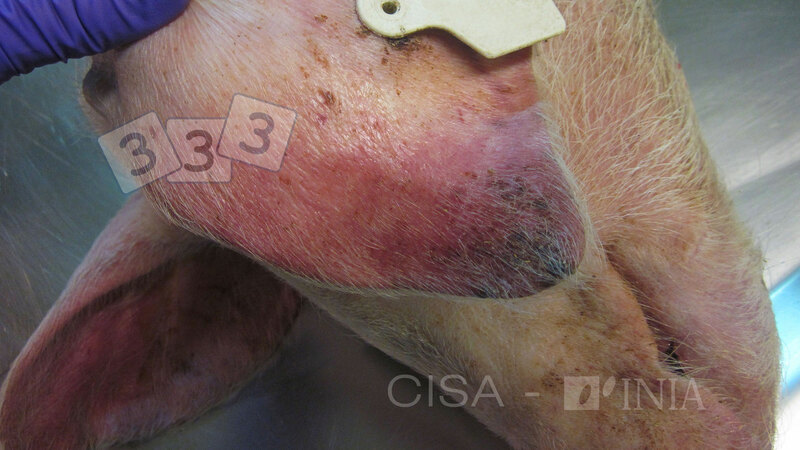 Besides classical swine fever and salmonellosis, the differential diagnosis must also include necrosis of the ear tips.